Can you tell that I am loving my new watercolors by QOR ?!? The colors are so vibrant, go on with such ease. I have been using watercolors that take several applications to achieve a desired strength in color, but these are a one coat application. Just gorgeous your water coloring, Penny! Love it! Your hummingbird and that flower are just perfect! This is beautiful. I love watercolor and have been doing some but it's the backgrounds I have trouble with. Yours is fantastic. Such depth! Beautiful colors! So surprised that this is a one layer card. 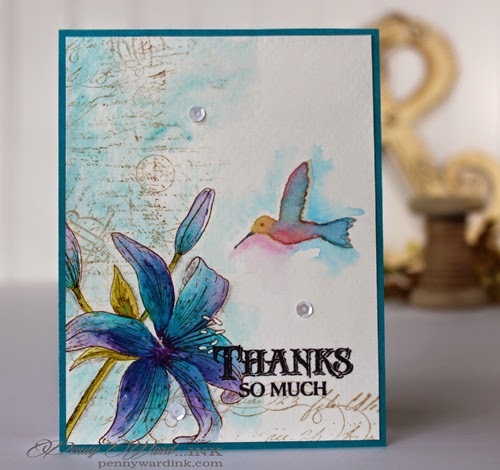 A gorgeous card Penny, a lovely background and beautiful lily with a cute hummingbird!! WOW - when you watercolor it look so artistic like it should be hung in a gallery and mine is just ho hum!! 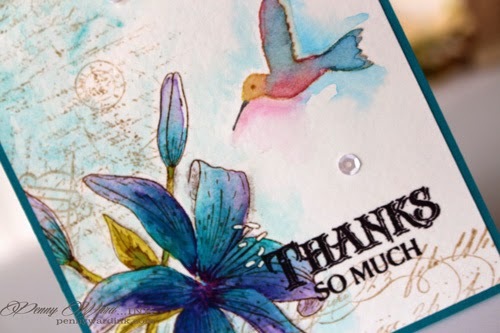 You do such a stunning job and this floral card just shines and sings and hums a happy tune!! What awesome talent you have!! Hugs to you! !